Alessandro Petacchi outlasts a late charge from Mark Cavendish to win stage two of the 2011 Giro d’Italia. 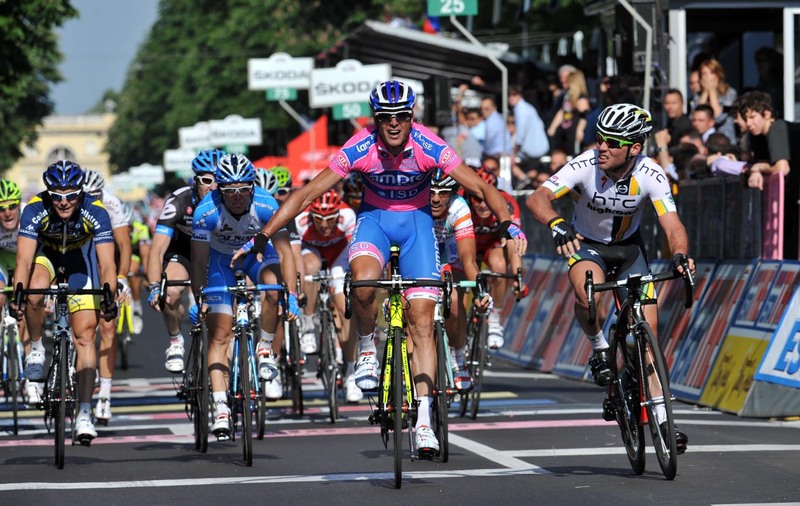 Alessandro Petacchi (Lampre-ISD) won stage two of the 2011 Giro d’Italia, a mostly flat 244km leg from Alba to Parma. The stage was marked by a heroic solo break by Sebastian Lang (Omega Pharma-Lotto), who built a monstrous lead of nearly 20 minutes at one point — and collected a time-bonus “sprint” and the KOM along the way — before being retrieved with 26km to race. The early catch saw a counterattack from Leonardo Giordani (Farnese). Jan Bakelandts (Omega Pharma) and Michal Golas (Vacansoleil) marked him, as did Ruggero Marzoli (Acqua e Sapone), Eduard Vorganov (Katusha), Jerome Pineau (Quick Step) and Daniele Righi (Lampre), and with 20km to go there was a small group off the front, hoping to steal a march on the sprinters. But as the escapees quickly took a 16-second advantage with as many kilometers left to race, Garmin-Cervélo came forward to help drive the chase for sprinter Tyler Farrar, and the escapees were brought back with 8km remaining. That set up a chaotic bunch dash to the line, which saw Petacchi outlast a late charge from HTC-Highroad’s Mark Cavendish, with Manuel Belletti (Colnago-CSF) finishing third. Cavendish was not happy at being beaten, gesticulating at Petacchi as the two crossed the line in a photo finish. The Brit had tried first to come around the Lampre sprinter on the right, but was forced to try again from the left after the Italian slightly altered his trajectory. “Other sprinters, not only me, would have blocked him. If I changed direction I didn’t realize it. I’m sorry,” said Petacchi. Omega Pharma-Lotto once again showed its colors at the front, sending Lang away in the first few kilometers. He was given plenty of leash before HTC-Highroad gradually started reeling him in for race leader Marco Pinotti and Cavendish. With 70km to go the 2006 German national time trial champion’s lead had been halved as HTC and RadioShack drove the pursuit and he was showing the effects of a long, lonely day in the saddle. Ten kilometers further along the margin was 4:30. Pinotti needed a wheel change with 41km to go, but there was no panic — a team mechanic quickly made the swap and the race leader got back to work, threading his way through the cars. Lang’s lead had fallen to three minutes as behind, a crash took down Vassili Kiryienka (Movistar) and an unidentified Leopard-Trek rider. 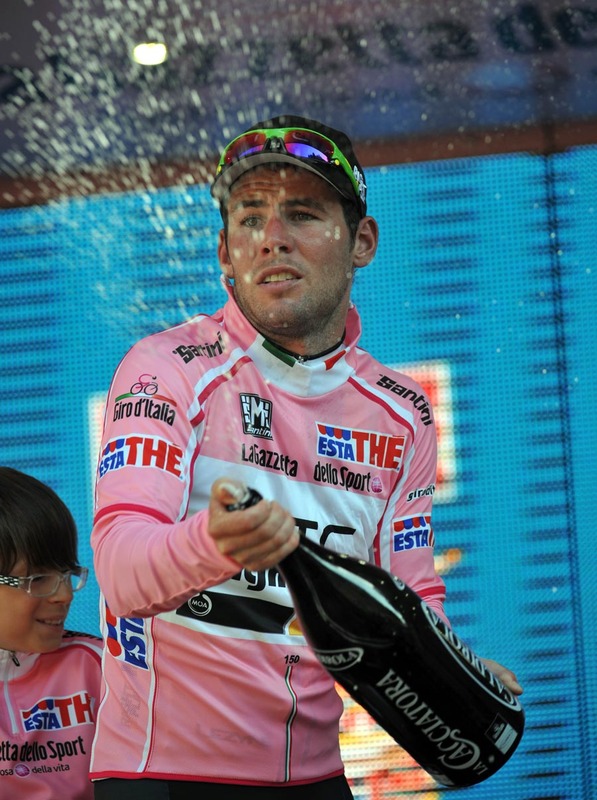 Cavendish gets the maglia rosa, which isn't a bad consolation prize. | Graham Watson photo. The lone leader scooped up a six-second time bonus at the intermediate sprint and then soldiered on to take the KOM at Tabiano Castello with 90 seconds of his once-mighty advantage still in hand. Then he sat up, his work for the day at an end, and waited for the bunch to join him. The catch came at 26km to go and Giordani opened the ball. Bakelandts and Golas chased, and Marzoli, Vorganov, Pineau and Righi latched on, and with 20km to go the sprinters’ teams found themselves chasing a small, dangerous escape. It wouldn’t survive — and adding injury to insult, a touch of wheels with 10km sent Vorganov to the deck. Shortly thereafter the break was back in the bunch, and Vacansoleil and Lampre were trying to get organized at the front, with Garmin lurking nearby. Despite their work chasing the breaks Farrar was well positioned going into the final 1.5km. Cervélo led into the penultimate right-hander, but couldn’t close the deal. Then HTC’s Mark Renshaw laid down a surge for Cavendish — only to see Petacchi slip past at the line. Farrar was shut out, too, settling for seventh on the day. As for Cav’, he took some consolation from his defeat — he slipped on the maglia rosa of the Giro’s overall leader, and his HTC mates occupied all three steps on that podium. The Manxman now leads teammates Kanstantsin Sivtsov and Craig Lewis by 12 seconds on the overall. But in a very mountainous Giro, he knows his tenure in the maglia rosa will be limited. “There are five stages which can end in a sprint,” Cavendish said. Monday’s stage three takes the peloton for a 173km ride between Reggio Emilia and Rapallo. Agence France Presse contributed to this report. Stay tuned for more news from the Giro, plus photos and tech reports. 3. Manuel Belletti (Ita), Colnago-CSF, s.t. 4. Roberto Ferrari (Ita), Androni Giocattoli-Serramenti PVC Diquigiovanni, s.t. 5. Borut Bozic (Slo), Vacansoleil-DCM, s.t. 3. Craig Lewis (USA), HTC-Highroad, s.t.